We moved to Connecticut two years ago. It took nearly as long for people to start telling me that I am “religious.” It usually comes as an explanation for why I won’t like something or why I wouldn’t know about some local gossip. It almost always seems to mean that I am an outsider by choice. Ours is a quintessential New England town—lots of old white houses with black shutters, lots of tall maple trees, a town green complete with an old white Congregational church whose bells chime the hours. Most people don’t attend that church, or any other, on Sunday mornings. They get some sleep and walk the dog and watch the kids play soccer or take a walk in one of the local land preserves. The fact that our family gets dressed up and heads to a sanctuary every Sunday morning puts us in an unusual category around here, and when we add my writing and the worship CD’s that are often playing in the car, we mark ourselves as particularly odd. It makes good sense that other people would look in upon our lives and call us religious. It makes sense, and yet I don’t like it. First of all, I have often repeated the line I heard years ago that “Christianity isn’t a religion, it’s a relationship with God.” I still believe this statement—at its core, being a Christian is not about showing up in my nice jeans on Sunday morning or even about praying in the minivan on the way to school. It’s about getting to know God through Jesus. And yet over the years, I’ve also come to realize that the way countless thousands of people have been able to maintain that relationship with God is through religion—through showing up at church week after week, through getting on their knees night after night, through opening that Bible day after day. Religious practices cannot create a relationship with God, but they can sustain one. I guess I might be that kind of religious after all. Secondly, I don’t like the word religious because it seems negative. As if I’m different than regular people, and not in an attractive way. As if I’m moralistic or judgmental or simply out of touch. When Jesus walked this earth, he reserved his harshest words for these types of religious people, the ones who thought that their actions were more important than their hearts, the ones who patted themselves on the back for saying their prayers properly and yet ignored the plight of the hurting ones around them, the ones who ultimately decided Jesus himself needed to die. And I guess I worry that I might be more like these types of religious people than I would ever want to admit. Truth be told, on some days I might be more concerned with my kids’ outward appearance than their understanding of God’s love, more offended by my neighbors’ immorality than compassionate toward their neediness, more inclined to set myself apart as holy when the only thing that sets me apart is knowing how unholy and yet beloved I am. Now, as far as I can tell, Jesus was uber-religious even in the midst of his criticisms of the religious establishment. He knew the Scriptures and he prayed a lot and he hung out in the temple. And yet people didn’t seem to be turned off by his religiosity. Rather, they seemed drawn to him as a relatable person, someone who was cryptic and odd and yet personal and compassionate, one who prayed and healed and preached and also showed up at lots of parties. 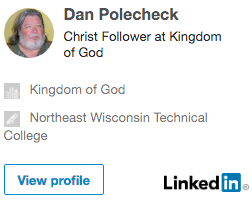 Which brings me back, I suppose, to following Jesus. His religiosity bubbled up out of his relationship with God. He called upon Scripture not as a cudgel but as sustenance against temptation, as an invitation to justice, as a guide to prayer and crying out with grief. He entered the temple because it was God’s house, and he desperately longed to be in God’s presence. And he broke the religious rules when they contradicted his relationship with God. He healed on the Sabbath. He sat down and talked with a Samaritan woman. He touched unclean bodies and let people with unclean bodies touch him. So in my own rather irreligious town, I can only hope that my religious nature reflects a little bit of Jesus and not of the ones he criticized. I can only hope that my churchgoing and prayer offering and Bible reading acts as a blessing to my community. I hope that my neighbors might start seeing me as religious and seeing that as a positive thing, as a lifeline, a means of grace. Posted on 24 Sep 2014 by Crusty	• This entry was posted in christian, christianity, Faith, spiritual and tagged Christianity, christians, devotional, Inspiration, Religious, spiritual. Bookmark the permalink.